The hugely popular French character Asterix returns in a feature length movie that stars a variety of French actors who make this cartoon character come to life. The story begins with a humble poet called Alafolix (Stéphane Rousseau) who is in love with a Greek Princess named Irina (Vanessa Hessler) that has unfortunately be promised to marry Brutus (Benoit Poelvoorde), the dimwitted son of Caesar. At wits end, Alafolix comes up with the idea that the winner of the Olympic games should be given Irina's hand in marriage and through careful consideration, the King agrees. There's only one more thing to do for Alafolix and that's ask for the help of the legendary heroes Asterix (Clovis Cornillac) and Obelix (Gerrard Depardieu). As they all go off to the Olympic games, Asterix and co soon discover that the Romans have other things planned and they must stop their nefarious plan in order to assist Alafolix marry his true love. For a movie based on a comic, Asterix at the Olympic Games is an entertaining flick that children of all ages will enjoy as it's strong on action, humour and some good old fashioned classic romance. Although there is a French dialogue version on this disc, there is also an English dub to assist those who hate subtitles and needless to say, it's quite a good version. The stars of the movie are Delon as Asterix and Depardieu as the huge lumbering Obelix who truly steal the show. 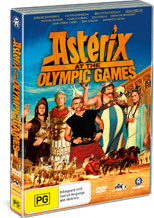 There is even a great cameo by Michael Schumacher as a Germanic chariot racer that adds to the humour of the series that we could happily recommend to the entire family.